Recently many microfluidic systems are increasingly equipped with functional units for ionic controls for various applications. In this review article, we define an ion bridge as a structure that controls current or distribution of ions in a microfluidic system, and summarize the ion bridges in the literature in terms of characteristics, fabrication methods, advantages and disadvantages. The ion bridges play two basic roles, namely to ensure electrical contact in a microfluidic network and mechanically separate a liquid phase from another. More interestingly, the charged surfaces of ion bridges, which can be chemically modified, create new characteristics such as permselectivity and concentration polarization. Asymmetric ion transport as well as ionic conductivity through the ion bridges suggests a variety of applications including sample preconcentration, electroosmotic pump, electrospray ionization, electrically driven valve and many others. This review categorizes the ion bridges into several classes and describes the structures, materials, fundamental functions and applications. 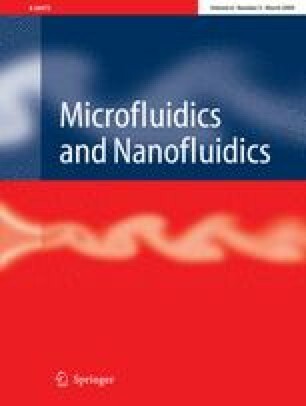 In Perspectives, new opportunities of microfluidics and nanofluidics provided by the ion bridges are discussed. This work was supported by the Korea Science and Engineering Foundation (KOSEF) grant funded by the Korea government (MEST) (No. R11-2008-012-00000-0) and by the Next Generation New Technology Development Program funded by MKE, Korea.